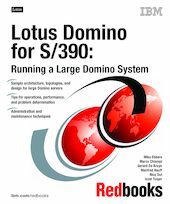 This IBM Redbooks publication describes how to run a large Domino for S/390 production system from both S/390 and Notes administration perspectives. It documents the experience of running the world's largest Domino/Notes e-mail installation at IBM Poughkeepsie, as well as the experiences of other consultants and customers from around the world. The book contains answers to questions commonly asked by customers, and these solutions are valid for any Domino platform. Part 1 describes the architecture, topologies and design of a large Domino system. It focuses on the organizational aspects and challenges of running Domino on OS/390. Part 2 reveals the secrets of operating, administering and monitoring a large Domino system on OS/390. It describes backup and recovery possibilities, problem determination, maintainance of software, and hints and tips. As well, it provides sample shell scripts, Notes API programs, and LotusScript agents to aid in administration. This IBM book is intended for Domino administators, OS/390 system programmers, and operators responsible for installing, configuring, operating, and administering a Domino system on OS/390.